KYOTO - Rainbow Line came from behind to deny favorite Cheval Grand a first spring Tenno-sho championship in Sunday’s Emperor’s Cup, the race that starts six straight weeks of Grade 1 action. 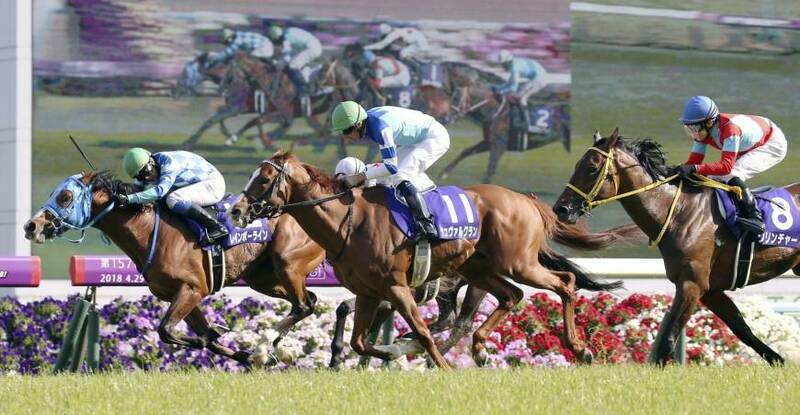 While Yamakatsu Raiden led the pack for most of the 3,200 meters over turf at Kyoto Racecourse, Cheval Grand stayed on his heels until a tenacious run after the final turn. But after a steady climb from the rear, second-favorite Rainbow Line burst ahead to earn his first G1 victory in 3 minutes, 16.2 seconds. Cheval Grand finished a neck behind the 5-year-old ridden by jockey Yasunari Iwata and was denied the spring title for the third straight year after finishing second last year and third in 2016. Fourth-favorite Clincher took third, trailing Cheval Grand by half a length. Rainbow Line’s time was 3.7 seconds off the record, set last year by Kitasan Black when it rewrote Deep Impact’s 11-year record time. Kitasan Black retired last year with seven career G1 victories, including last year’s autumn Tenno-sho and December’s Arima Kinen.